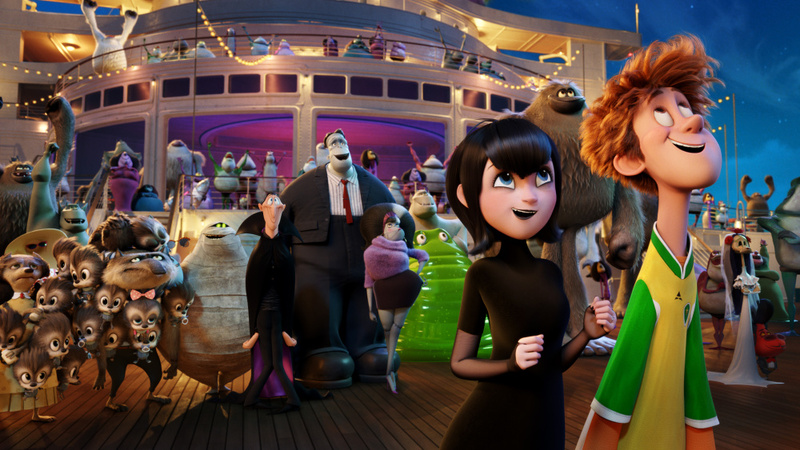 Hotel Transylvania: Summer Vacation marks the third instalment in the Hotel Transylvania series. The successful first two instalments followed the adventures of Count Dracula and his mishmash of monster friends as they tackled being monsters in the modern world. The first two films supplied a series of laughs mostly around the various powers the monsters held and ways that bits of them might fall off. There was also a strong message of acceptance being perpetrated around monster/ human relations which even resulted in some interspecies romance! A Monster Vacation isn’t trying to reinvent the wheel here, it is firmly set in retelling the same story all over again. Count Dracula has settled into his life as a grandfather and manager of a thriving monster hotel, yet all is not peaches and cream for the Lord of Darkness. Now that his daughter has settled down with a family of her own, the Count is feeling a little lost and lonely. His daughter, Mavis, thinking he is simply stressed out books the whole family (and vastly extended family making for a total stress filled vacation if you ask me) onto a monster cruise. Little do they know though that an old enemy is stashed on board seeking revenge. The plot of Hotel Transylvania 3 is less important than the characters on show. There are some solid laughs to be had with the expected monster puns and colourful CGI. The half-fish half-human (think mermaid but the opposite way around) cruise ship staff are brilliantly voiced by Chris Parnell (of 30 Rock and Archer fame) but Adam Sandler is just phoning it in as the Count. Some of the sequences feel strangely repetitive with an over reliance on synchronised dance sequences which just feels odd. Overall the film isn’t bad it’s just a bit blah. The charm of the first two movies lay in the surprises supplied by the monster-human interactions and a lot of puns! Though there are some funny moments scattered throughout, the overall film feels a bit hollow and leaves you with a sense that the third movie should most defiantly be Hotel Transylvania’s last.